The Social Security Administration (SSA) has two forms of disability benefits. The more common program is called SSDI or Social Security Disability Insurance, and is set aside for people with a proven work experience and who have paid into the SSA system. There is a second program called Supplemental Security Income (SSI), a federal program that supplements income for low or no income elderly and disabled individuals. The funds are used to provide basic needs like food, clothing and shelter. The program is not paid for by SSA but instead is derived from general tax revenues. The 2017 SSI monthly federal benefit payment is $735 for individuals and $1,103 for families. Most states supplement the federal payment ($10 to $200 per month), but some states don’t have a supplement: Mississippi, Georgia, Tennessee, West Virginia, Texas, Arkansas, Arizona and Oregon. 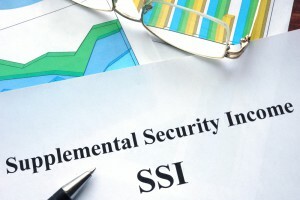 SSI has very low income requirements and therefore can be difficult to qualify for. Additionally, any in-kind benefits you’re receiving, such as free meals or shelter, is counted as income, as are your personal assets. Individuals are limited to $2,000 in assets and families are limited to $3,000 in assets. Asset examples are cash in the bank, stocks, property, household goods and insurance policies. SSA is very strict about this. The only things that are excluded are your home and a single automobile for transportation; both are considered necessities. They also exclude things like wedding rings or money set aside for burial and funeral services. Your total income, earned and unearned, will be reviewed to make an SSI determination. Money from job wages is earned income; a spouse’s earned income is also counted. Passive or unearned incomes are benefits like child support, pensions or veteran’s benefits. You can work and still qualify for SSI, as long as your wages remain below the SSI income threshold. SSA needs documentation of your Social Security number (SSN), date of birth, place of birth, and proof of US citizenship like a birth certificate. The same information must be provided for current and former spouses, and for all children 18 and under. The process can be involved and challenging, but we are here to help you determine your qualification for Supplemental Security Income (SSI).